Present state: The original entrance gate and some railway fencing survive. A two-storey building with a sack hoist stands at the west end of the yard. Its use is not known, but it can be seen in a number of old photographs. At the back of the yard opposite the entrance there are a number of bays now used to park vehicles; it is assumed that these are the yard coal bins. 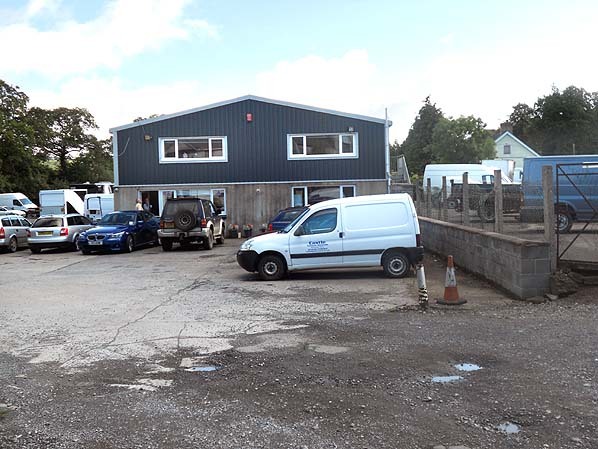 The site is occupied by Ceir Castle Motors, a van and truck dealer. Notes: Newcastle Emlyn and Adpar are two adjacent communities either side of the River Teifi. To the north is Adpar in the County of Ceredigion (Cardiganshire) and, to the south, Newcastle Emlyn in Carmarthenshire. A bustling market town community grew up around the crossing point over the river, whose tight meanders made the site a natural defensive position, first built on by the Normans. The main industry has always been agriculture. By the end of the seventeenth century the town had recovered from the depressing economic effects of the Civil War. There was a good market for corn all the year round, due to the rich fertile lands in the local area. The economic recovery seems to have been due chiefly to the industrial revolution, during which coal and iron works and canals opened in Kidwelly and neighbouring towns. This created a demand for agricultural produce which proved beneficial for the town. Extensive grazing land for sheep, an abundant supply of soft water, and numerous fast-flowing streams and rivers to power machinery encouraged the development of cloth manufacture, which also has a long local history. At its peak in 1895, there were 325 woollen mills in the Teifi Valley area. Although the Carmarthen & Cardigan Railway Company was formed in 1854, and construction started in 1857, it was to be another 38 years before the railway finally reached Newcastle Emlyn; and that is where it stopped. 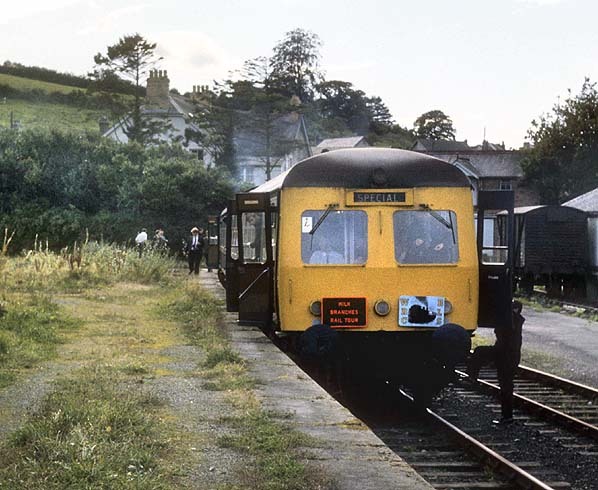 Although an extension to Cardigan was part of the original plan, passengers had to make do with a bus service from Newcastle Emlyn, albeit initially provided by the Great Western Railway. Having taken so long to reach the town, the railway was well patronised. Newcastle Emlyn, with its railway terminus, was regarded as the centre of the old Tivyside society. In the winter, whenever a ball was held in one of the neighbouring mansions, or in the Salutation Hotel, many coaches and horse-drawn vehicles would draw up outside the station to transport the guests to the ball. 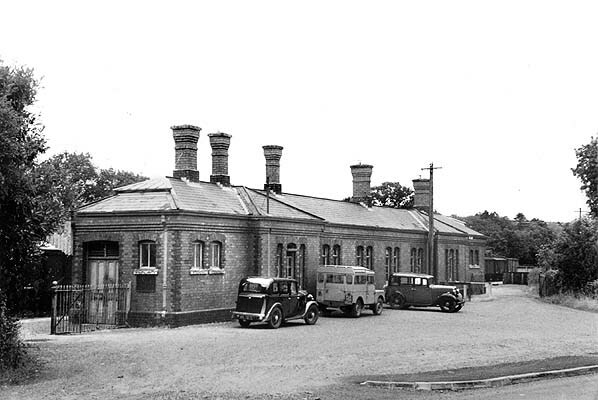 The station had a single platform on the down side with a long single-storey brick building at the west end, with five tall chimneys and a hipped slate roof. A wide canopy ran the full length of the building. All the station facilities, including booking office, station offices, waiting rooms and toilets, were contained within this one building. goods shed. There was a separate entrance off Station Road from where livestock could be unloaded directly onto the cattle dock. There were two sets of parallel sidings on the up side. At a later date, probably during WW2, a large concrete-panelled grain warehouse, standing on staddle stones, was built between these sidings. An earlier two-storey warehouse with a sack hoist was provided at the end of the sidings along the western boundary of the goods yard; this is the only building still standing. The coal yard with coal bins was in the north-west corner of the yard, close to the 6-ton yard crane. The GWR opened a corrugated iron, one-road straight-through engine shed with a Dutch barn-style curved corrugated iron roof, and an adjacent turntable at its west end. The shed, which opened with the station, was on the up side to the east of the station, opposite Pandys Woollen Mill. The shed (No. 157), was a sub-shed of Carmarthen; in 1947, 0-4-2T No. 5819 was allocated there. The shed closed on 15 September 1952 and was demolished in 1964. The station signal box with a 17-lever frame was sited opposite the goods shed, on the up side. 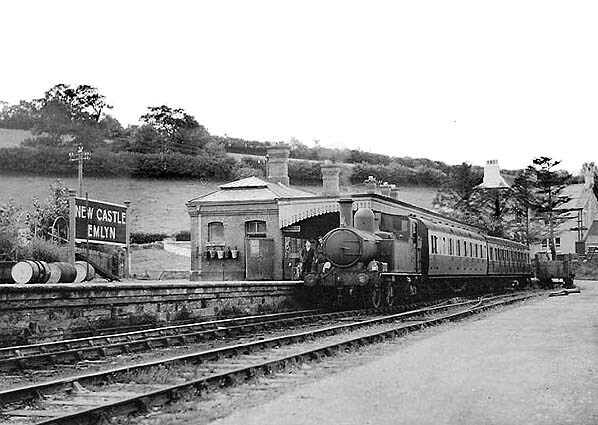 Newcastle Emlyn closed to passengers on 15 September 1952 but remained open for goods traffic. 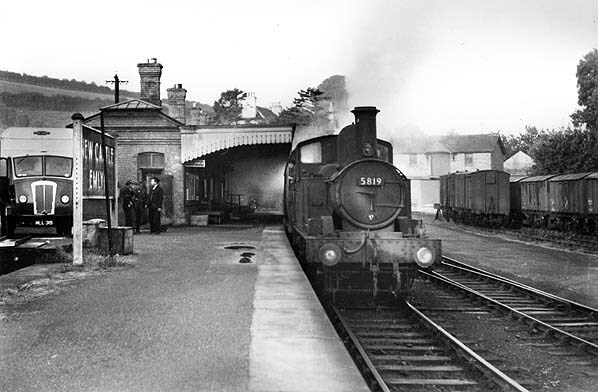 The platform buildings were demolished in 1966, and by 1968 the signal box had also gone, but goods services continued to allow milk trains to reach the former Co-operative Group creamery which was located at the station. It was later owned by Dried Milk Products and latterly produced cheese; now, as Saqputo, it is the town's biggest employer. The station closed completely on 22 September 1973, and the track was lifted in 1976. 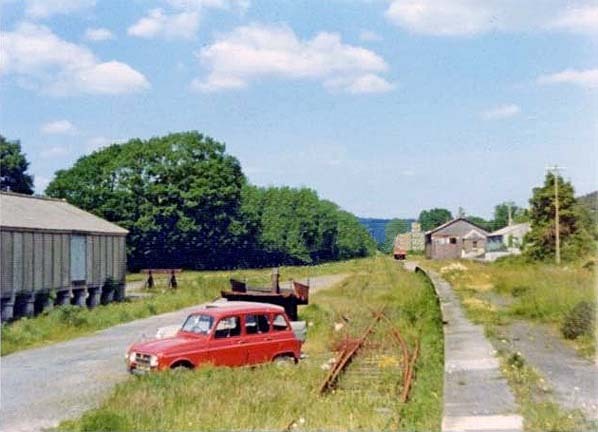 It is unlikely the Teifi Valley Railway will ever reach Newcastle Emlyn, as this would require the rebuilding of a bridge over the River Teifi which was demolished following storm damage in 1987. Click here to see a picture of a model of the goods shed and engine shed, and here for a photo of a model of the signal box. The freight that kept the main line open was dominated by milk traffic between Carmarthen and Lampeter, where trains were routed to the last remaining part of the main line to Aberystwyth as far as the creamery at Pont Llanio near Llanddewi-Brefi which survived until 1970; they also used the Aberayron branch as far as the creamery at Green Grove near Felin Fach, which remained in service until discontinued by British Rail in 1973; this resulted in the final closure of the line. Track was left in place until the summer of 1975.
to passing traffic on this busy road compared to the less conspicuously sited Bronwydd Arms station. Once the southern extension of the Gwili Railway is complete, it will increase the length of the route to around 4½ miles. Railway staff pose for the photographer while a passenger train waits to depart for Carmarthen in 1911.Built for the Manchester & Milford Railway by Sharp Stewart (works no. 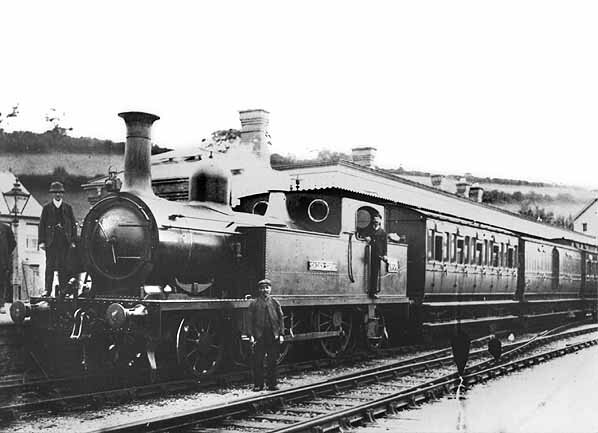 4128), this loco was originally numbered 6 and named 'Cader Idris'; it passed to the GWR and received the number 1306, (which it is seen carrying here) and lasted in service until April 1919. 1906 1:2,500 OS map. The layout of the station and goods yard is clearly seen. The goods shed is on the south side of the passenger line, with a siding passing through the shed and terminating at the cattle dock to the rear of the platform. Four more sidings fan out to the north of the platform. The one-road engine shed and turntable are seen top right. The building at the west end of the yard, beyond the sidings, is the only building still standing. A Carmarthen train waiting to depart from Newcastle Emlyn station c. 1930s. 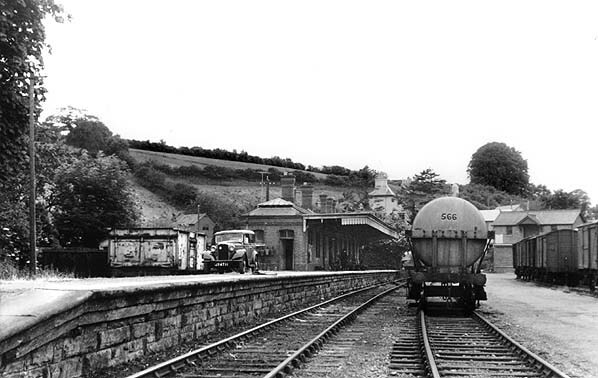 Newcastle Emlyn station in September 1952, shortly before closure to passengers, A British Railways parcels lorry stands on the far left. 5819 entered service in August 1933 having been built at the GWR Swindon works. This Collett-designed 0-4-2 lasted until withdrawal from 87G, Carmarthen shed, in July 1957; it was scrapped later that month at Swindon. These 58xx class locos were almost identical to the 14xx class, but none of the twenty built were push-pull fitted, even though they were built for light branch line work. Only one lasted into the 1960s and none are preserved. The building in the background with the sack hoist is the only building still standing. be noted, on the far left. 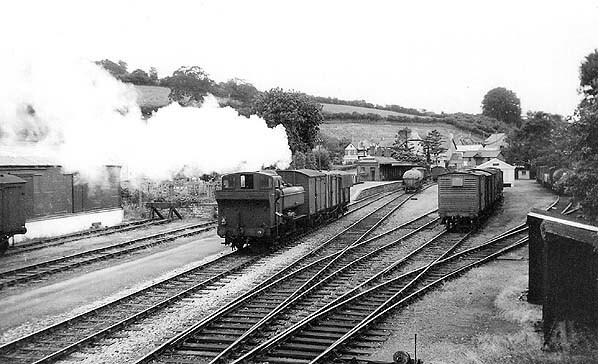 Newcastle Emlyn station in July 1958. Six years after closure to passengers little has changed, apart from the removal of station signs. Newcastle Emlyn station forecourt in July 1958. Newcastle Emlyn was a regular destination for railtours. 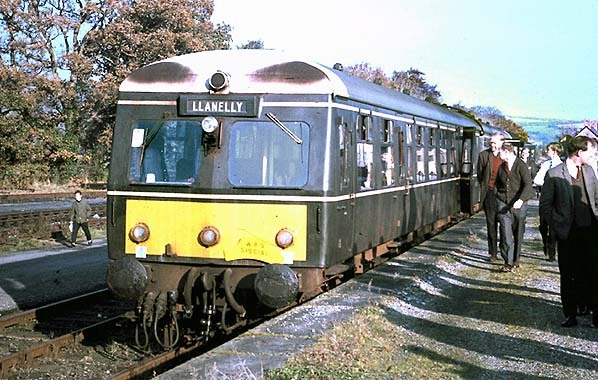 The is the SLS ‘West Wales Railtour’ on 16 May 1964. This part-steam loco and part-DMU tour also visited the Aberayron branch. 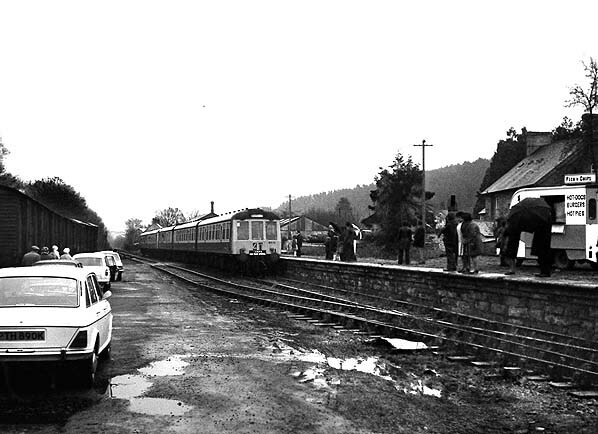 Newcastle Emlyn station in September 1967. Although the station remained open for freight traffic until 1973 all the buildings on the platform have been demolished. The large building on the right between the sidings is a grain warehouse, possibly built during WW2. It is standing on staddle stones to prevent rodents from getting in. A similar warehouse was build at Llandyssul. Another railtour at Newcastle Emlyn, on 17 November 1968. This is the WRS ‘Central Wales Railtour’. The route was: Birmingham, Wolverhampton, Shrewsbury, Craven Arms, Builth Road, Llandovery, Llanelly, Carmarthen, Newcastle Emlyn, Felin Fach, Pont Llanio and back to Birmingham. Yet another railtour at Newcastle Emlyn. The is the BLS/WRS ’Milk Branches Railtour’ on 12 September 1970. The tour originated at Cardiff General, running to Port Llanio on the Aberystwyth line from where it reversed and ran into Newcastle Emlyn on the return journey to Cardiff. 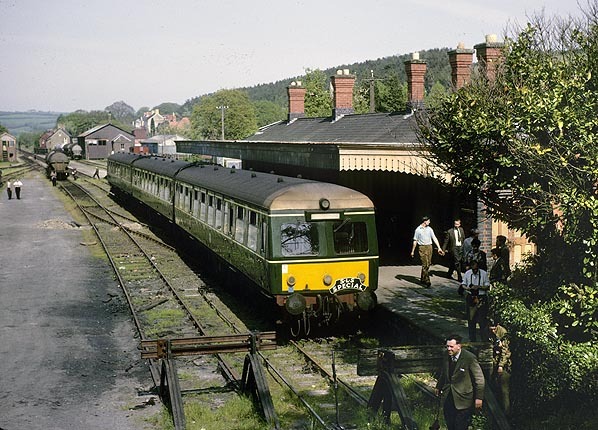 The last passenger train to Newcastle Emlyn station was the R.C.T.S. 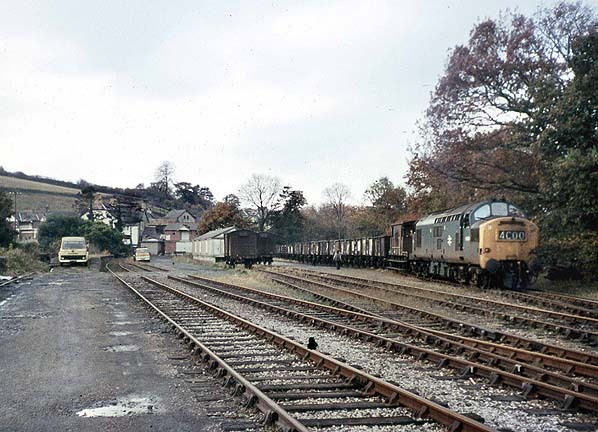 (Bristol Branch) Farewell to the Teifi Valley Milk Branches railtour on 30 December 1972. 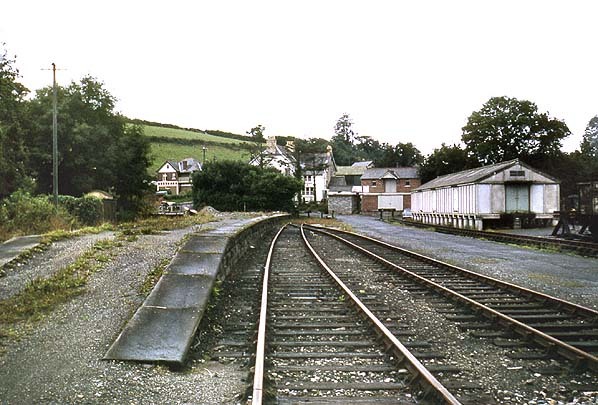 Newcastle Emlyn station looking north-east in 1974, a year after complete closure of the line. The site of Newcastle Emlyn station looking north-east in September 2012. The wall runs along the line of the platform; the office building is on the trackbed.